Shmergie blogged about 8 random things about himself, and then came up with 8 random things about me. They are more or less true, but none are as true as number 8. Enjoy! Just so you know, I´m heading out to Uruguay tomorrow and then Patagonia on Sunday, and I´ll be back August 6th. More stories after that! I joined a pilates place yesterday, and it’s AMAZING! I went and took a free class, and totally loved it, so I paid for the next month’s worth. I can only afford 1 class a week right now, but I think next month I may budget for 2 classes a week. It’s a really nice place, very small, and the classes are done on exercise machines that provide resistance. There were only 2 of us in my class this week, so we got really personalized attention. The instructor was sooo nice, and I understood everything she said. And you know what’s even better? She understood me! She didn’t ask where I was from, and she gestured a lot when she was speaking, she didn’t try to speak English to me, and I never had to apologize for my Spanish. So I decided that while I’m going to look amazing because of these classes, I need to do more. The main thing is that I should limit the number of delicious pastries I eat. I also need to figure out how to get some more veggies into my diet. Interestingly, I found that I have some extra time on my hands right now before dinner, and I found an article that has been saved on my computer for a few months. It’s all about training the core muscles (deep abs and hip abductors) to improve running form. It outlined a 9-week training plan, which would really complement my pilates work outs beautifully. I think I may get started on it tonight! Friend with benefits, or, as my profesora explained in class, “un amigo que tiene derechos especiales…entiendes?” Best spanish word ever. On Sunday morning I went to church here for the first time. It’s a Baptist evangelical church called Cielos Abiertos (open heavens). There were prob. about 100 people there, and the service was 3 hours long. Now, normally, let’s be honest, no one wants to sit through a 3 hour service, but I honestly didn’t even look at the time while I was there. It was something like an hour of singing, dancing, praying, dancing and jumping around (even though the majority of people are older than my parents!) then an hour of a sermon from a converted jewish man from Jerusalem who was just visiting for a while. Then probably another hour of singing, dancing, jumping and praying. This is the coolest church ever! Bethany Dixon (my new favorite person!) told me about this church, but she didn’t tell me how amazing it would be! Everyone arrives everywhere late here in Argentina, so I got to the 10:30 service at 10:20 and was awkwardly, AWKWARDLY the second person there, and everyone else got there after the service started, and it was full by 11. So I guess 3 ½ hours, not 3, because we were done at 2. Before it started, this uber nice girl, Vanessa introduced herself to me, and told me she’s going to help perfect my Spanish. After the service, the pastor tried to say 1 sentence to me in English, and she shushed him enthusiastically. She told me that all the young adults/kids our age in the church get together on Saturday nights to hang out and from what I gathered worship, eat and chillax. Sounds good to me! And, they’re all Porteños, so that makes them even cooler! This Friday is el día del amigo, and there’s a big church get together in the evening, and I’m most definitely going! I guess el día del amigo is a pretty big deal around here? A lot of restaurants have signs that say “make reservations early for el día del amigo” or something to that effect. I normally wouldn’t go to an evangelical church, but they’re just so friendly! And I feel like my accent is much better when I sing in spanish. God has blessed me in countless ways since I’ve been in BA, but this is the mother of all blessings, I really hope I get to spend a lot of time with the people I met there. There are quite a few people my age, and they’re genuinely excited about Christ and their faith. When I talked to the Chapman girls on saturday, chelsea asked me if I have any friends that are uplifting, and I do, but there’s just something different about sharing your faith with someone that is hard to find with other people. On Saturday night, our group of 15 went to a tango show near San Telmo (a barrio in BA). It was so fantastic! I don’t really hang out with that group as much of the rest of them do, because I’m in a different class, so it was cool to get to know them a little better. We took a van from Belgrano, and when we arrived at the place, it was like this really old fashioned looking building—and we took a tango class for an hour. There were a bunch of people there—it’s included in the show, so everyone who later had dinner, etc. was there for the lesson. It was an L-shaped room with a narrow balcony around the outside, and it really reminded me of that JLo movie with Richard Gere. What’s it called? I have no idea. Anyway, I really liked our instructor, she explained everything really clearly in Spanish, and then again in English, and when she spoke English she always said ‘estep’ instead of ‘step.’ It was so cute! I wish I spoke like that. I wish the waiter at the café I’m at right now thought my lack of skill in Spanish was an endearing accent instead of treating my like an annoying foreigner! Anywho, then we had a DELICIOUS dinner of salad, steak and a brownie with ice cream for dessert. I’m not usually much of a wine drinker, but they had really good wine (the sweeter (wetter) the better for me) so I think I could try some more someday. I miss vegetables. Whoa, I almost said I miss salad. That would be extreme. Its not that I don’t like salad, it’s just that I need it to be a pretty good salad to really enjoy that. And the one I had on Saturday was such a salad. Also, I found that at lunch time at school they have salad as well, although not quite at the level of the tango place. Getting back to the show though, I had a fantastic time getting to know the other students at my table a little better, they’re very fun. The show started during dessert, and there was a lot of singing that I didn’t quite follow, and the performers came out into the audience and sang to the girls and at one point, grabbed several audience members and danced with them between the tables. It was all very festive, and very well done. I definitely want to go to another tango show while I’m here! 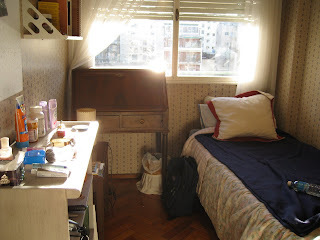 Mi cuarto pequeño. ¡Que lindo! It’s so cold* here right now! On Monday, it snowed in BA for the first time since 1918! Yowza. So I brought my new northface jacket, but I’ve been layering sweaters underneath it and I’m going to stock up on a few more over the weekend. I’ve been a teeny bit sick (runny nose, sore throat) for the last 3 or 4 days, but I’m drinking lots of tea and trying (fairly unsuccessfully) to go to bed early. The big news in my life right now is that I moved into my permanent room here at home! You know about how big a shoe box is? That’s what my room is like. I’m posting a picture of it so you can get the full effect. As you can see, my bed is half the width, with room for a desk plus a few inches next to it. I have a book case and a closet that actually give me a lot of space for organization. My only issue with the room is that I have a lamp that doesn’t work all the time, and only one electrical outlet that doesn’t work all the time. Hmmm, I’m going to steal a lamp and a surge protector from Tyler’s room when he moves out. Yay! I’ve thought about just stealing the room, but I think of it as his room too much already. And we’re getting a new girl to replace him! It’ll be weird being the one that “knows what’s going on” (because I won’t actually know) but Kim and I are both hoping the girl is really cool. And why wouldn’t she be? Next exciting thing coming up is that our group is going to a tango show Saturday night. More to come on that! On Sunday night Argentina played Peru in the Copa América (American Cup) so naturally we all gathered for the festivities at Anne and Alicia’s apartment in Recoleta. These two girls are in my class at UCA and are from American University in DC. They are staying at a friend’s vacation place until they move into their real apartments with argentines. Anyway, this place is uber fancy, and takes up the whole 5th floor of the building. So we hung out there for a few hours after the soccer game, and then decided to go down the street for ice cream a little after midnight (I love how everything’s open so late here!). Three people decide to go down the stairs, because we wouldn’t all fit into the elevator. The key to this story is that elevators in apartment buildings in BA tend to be really old, the kind that has a door you open on the outside, and then like a cage door that slides across on the inside. The elevators where I live are manual like this too, and often when they stop, they aren’t exactly lined up with the floor when they stop either. So in this particular elevator, there was a regular wooden door that opens outward, and then the slidey cage door. Seven of us got in the elevator. Now, I don’t know the limit there, but at home its definitely 3—but this elevator didn’t say. When we got to floor 0, or ground level, we were a good 8 inches below the floor. No big deal, right? Definitely a big deal. The wooden outer door wouldn’t open. Our friends on the outside tried to run up the stairs and call the elevator to get it moving, or to find a neighbor or doorman to help. We even tried jumping simultaneously and hitting the 0 floor button again. The alarm button didn’t do anything, and the ‘stop’ button actually just pushed straight back into the wall, leaving a hole there…so I guess that one doesn’t so much do anything. We got a good video of us in there, which I’ll try to put on Facebook or something soon. A few people weren’t too pleased, but really, how often are you stuck in an elevator? At least this one we had the means to try to force the door, and it wasn’t airtight, so we had oxygen to spare. I don’t know what I would have been able to do in a regular, modern elevator. We ended up getting out after about 20 minutes. Noah balanced on a ledge and reached up to the top of the outer door. He unscrewed an electrical looking box thing with Alicia’s insurance card and lifted a latch that opened the door. There is a store down the street from where I live that is simply amazing. It is a genius collection of all you could ever want to own, and things you’d never even thought of, and it is called COTO. My favorite thing I’ve purchased at this store is Milka brand chocolate*. However, I also bought my hairdryer here, and omelets at the cafeteria upstairs. There are computers (laptop and desktop) in the hairdryer aisle, and frozen meat across the aisle from the TVs. So of course, COTO was my first choice when I needed to buy some lined notebook paper for class. After walking around the giant store that has a section that belongs in the Container Store and another that could be the Argentina equivalent of Crate and Barrel for at least 15 minutes, I decided to ask someone where the notebook paper was. After following what I consider to be poor directions to the far end of the store, I hunted around several aisles before noticing that the store’s entire supply of paper was a stack of 10 or 20 reams plain white printer paper (legal and standard sizes). *sigh* The one thing not available in this entire gargantuan metropolis of an Argentina Walmart is a spiral notebook. Such is life. Riquísimo: delicious beyond comprehension. Applies to Milka bars and mediolunas*. Medioluna: Croissant. A bit smaller and heftier than your Costco or Safeway croissant, I would happily settle down with this delicious breakfast treat and spend the rest of my life with it. A typical BA breakfast includes tres (3) mediolunas, café con leche (coffee with steamed milk) and fresh squeezed OJ. On Sunday afternoon I purchased all this at a cozy little coffee shop for seis (6) pesos, or $2. Sometimes when I´m just walking around the city, I´m like, hey, I´m in ARGENTINA. Like, what is that about? Oh, just to warn you, this entry might be a bit overwhelming, because I had a super fantastic day, and now I have a runner´s high. And I may or may not be eating wafers drenched in chocolate. OK, where to start? There are really cool kids from DC here, and I´m in an intensive spanish course with a bunch of them for 3 weeks. Today, a few of us went out to lunch (a good lunch here is between $3-4 US) and then I decided to go out on my own to find a post office. Rachel went with me for a while, but it was a bit of a wild goose chase, so she headed home after prob. 20 minutes. So I totally found it, and my credit card was denied (something I need to fix PRONTO!) so I just got the one stamp. Anywho, on my way to the Correo Central (post office) I met these guys selling a newspaper/magazine thing and I was like, no gracias. But they said (in spanish) “do you know what this is?” and I said no. Well, it turns out its like Real Change in Seattle, the magazine that homeless people produce and sell to make a living. So these guys were really nice, and apparently homeless, and I bought a magazine for like 60 cents from them. And then I realized its really good for me to be reading stuff in spanish. And this is also so perfect because I have a new game plan for spending my time in BA. Are you ready for this? Its pure genious. OK, I´m going to volunteer with a non profit. Perfecto, no? That way, I´ll meet argentines and have so much life experience I won´t know what to do with myself. Then, walking back to the subway from el correo, I walked past the ministry of justice and human rights. O heck yes. I´ll be googling that later, most definitely. Then when I got home, I went for a run. Sometimes my host madre and I dont have a lot to talk about, but she sat me down at the dining room table and drew me a map to a park along the rio where I could run. So fun! Well, fun to chat with her (again, in spanish!) but I had decided already to go find the church I´m going to go to. Its a 15 minute run from my apartment, so now I need to figure out the bus. I´m excited for that. And now to adress the title of this blog. BA looks so european its not even funny. well ok, maybe a little funny. The neighborhoods vary SO MUCH, from looking exactly (EXACTLY) like Iasi, Romania, to little residential streets in London. Its so cool here, and completely flat I might add, I haven´t encountered a hill yet, but it doesn´t quite seem like BA to me, because there are so many outside influences. But it´ll be cool to really get to know it and then travel other places and see how they remind me of BA. And I love that its winter! The air is so crisp, I had a really good run, and saw a lot of the neighborhood I hadn´t seen before, so that was really good. The only problem is that the chilly air reminds me that I´ll be home in the Northern winter and then I´ll be wrapped up in my down comforter on the couch watching the holiday (which, by the way, I talked about in my class today), and that makes me want that to be like, next week. Or maybe later this week. Liz, and devan, this is for you: I don´t want to get my hopes up, but I noticed that the room I´m going to move into next week, has what looks awfully similar to a down comforter on the bed. Now, I don´t see where it would go, unless it belongs to Fernando, so I´m thinking…I´m going to be enjoying that in approximately 7 days. Could I be more excited? Anyway, more to come on my class and all the coolness. I´ll also be sure to keep you posted on all the goings on of my life and the people in it. I expect to begin changing the world soon, too.